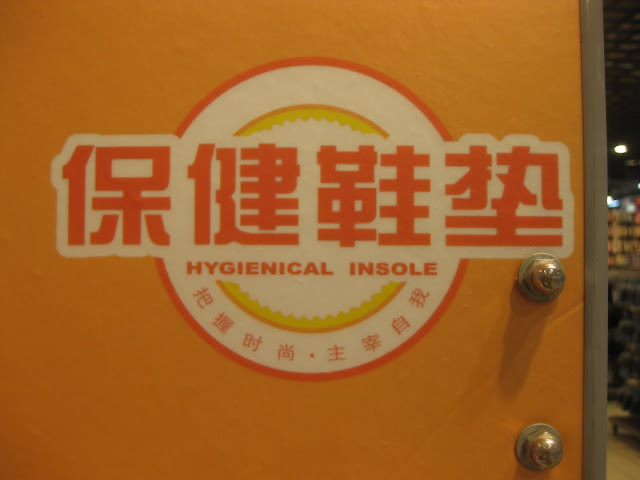 China has gained a notorious reputation for very interesting and sometimes intriguing, badly translated English signboards. 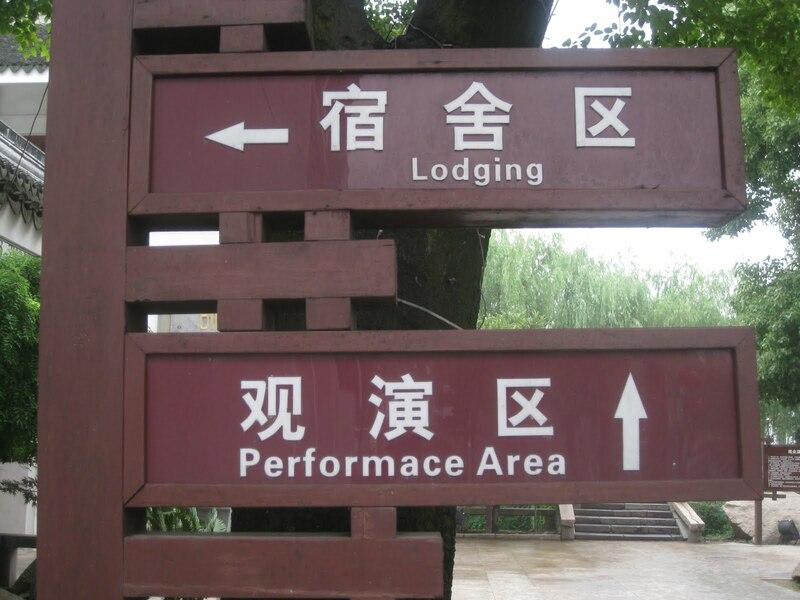 Some of their signs are literal translations while many are simply inaccurate. 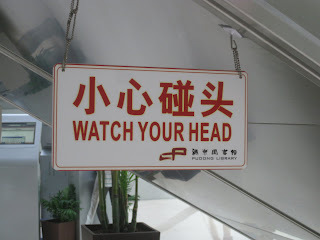 I was in Shanghai recently and couldn’t help but notice some signs in strange English. 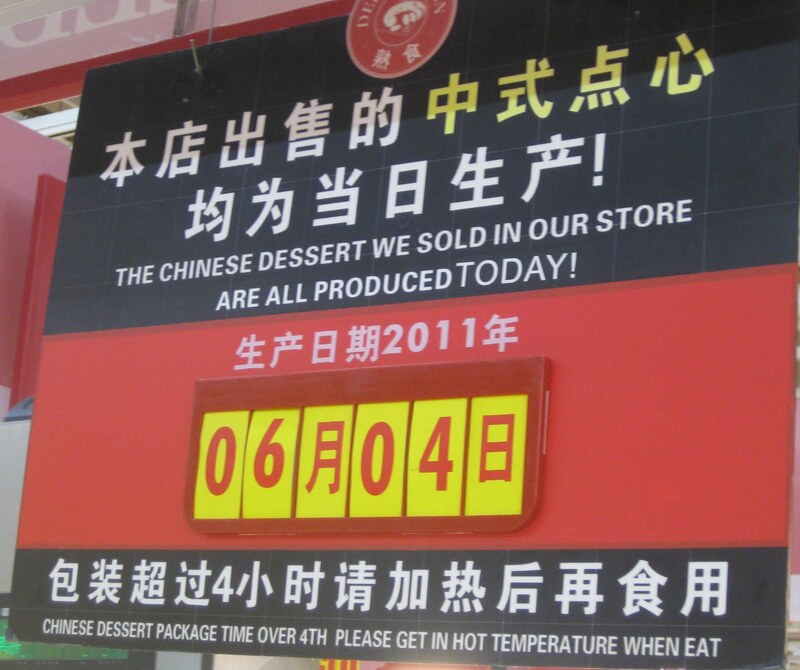 It makes me wonder why they do not bother with proper research and proof-reading before putting up those signs. Or if they will give someone qualified that job to just get it right. 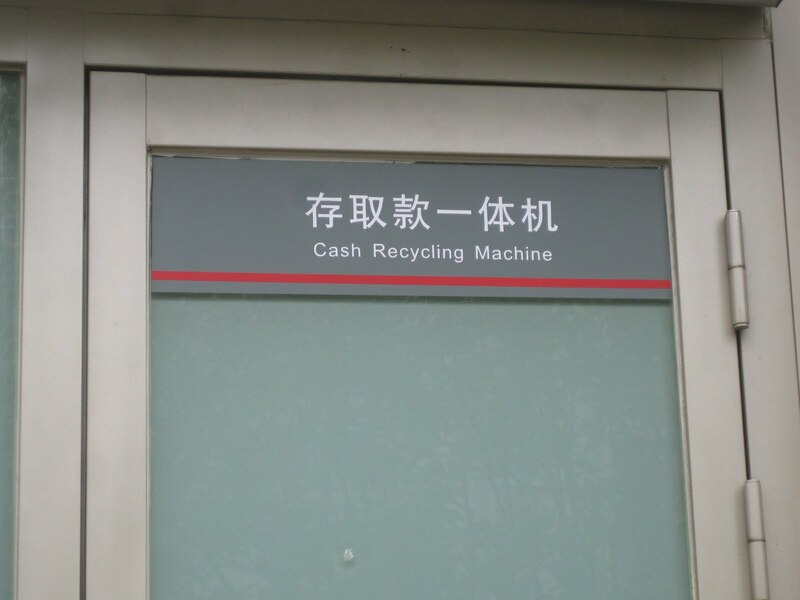 Take a look at this – poor spelling and weird meanings! warns people to, "Watch Your Head" or risk getting it knocked! assuring shoppers that the insoles are hygienic. 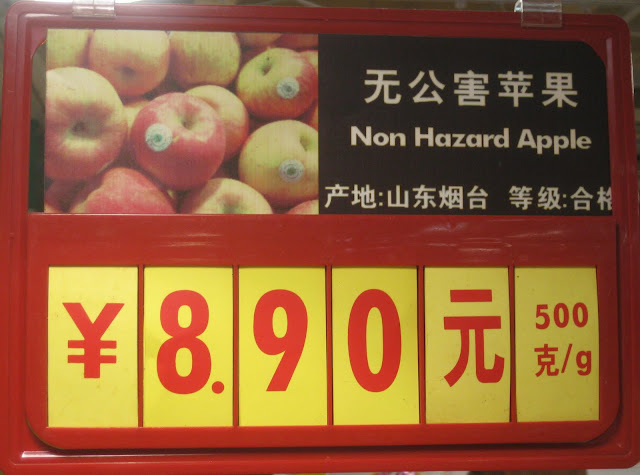 Do you want to eat Non Hazard Apple? Follow this sign to the Performance Area. he wondered if he has a sister named, evening ng? Three things took place recently to set me off on a quest for my Jaro mementoes: A visit to the all-new Jaro showroom, my wrestling match with our furniture cushions and reading about batu seremban or five stones, in an in-flight magazine. These events may seem unrelated but please bear with me to see how it all links up. It all started when I had a sneak peek of the revamped display of new products in the Jaro showroom at Jalan Sungai Chat. I’m familiar with Jaro because I used to frequent Jaro with my mum and aunties and I remember meeting their friends, Auntie Milly and later, Auntie Winnie who were once the managers there. After being introduced to their range of beautifully handmade products, I became a fan of these useful items and often shopped there for myself or bought souvenirs to present to visitors. 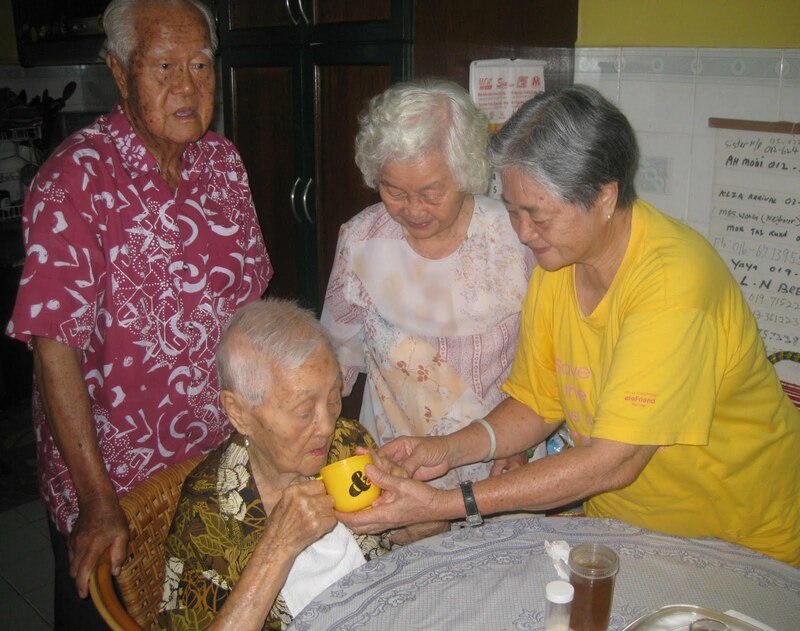 JARO or Johor Area Rehabilitation Organization has a proud heritage in Johor Baru and is an established brand for quality products that are handmade by people with disabilities. Since 1952 the disabled have been given opportunities to be gainfully employed in the sheltered workshops for bookbinding, basketry, tailoring, and handicrafts. Every Jaro product is special because its quality and workmanship is matched by the effort and determination put into its creation. For as long as I can remember our sitting room furniture was always made of cane or rattan probably because woven rattan is simply attractive and so cooling to sit on in our tropical climate. 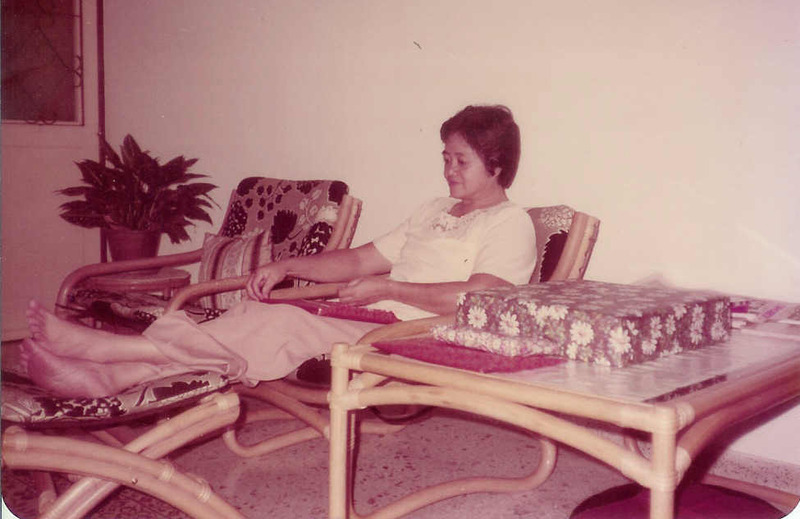 Since my parents were transferred back for work in Johor Baru, all our sitting room furniture was bought from Jaro and the latest set remains in good use today. When the cushion covers on our furniture are changed, it’s my job to put on a fresh set of covers. It takes a bit of skill to maneuver the large squares of cushions snugly into the fitted covers and while this procedure entails some serious wrestling with the cushions, this time I paid special attention to the fabric because this set of covers has lasted more than twenty years. And when I flipped over one of the covers, I was impressed to see that it proudly bore a label with the distinctive Jaro logo. The very sight of this drove me on in my quest and I quizzed mum to find any other Jaro products in our home besides the furniture and her pretty pot-holders. Just as mum has her timing to change cushion covers, she also has a regular routine to clear our storeroom so she knows what we have accumulated over the years. She’s a fountain of information that I can count on because she told me the exact location in the storeroom to find the Jaro rattan basket that I used as a vanity case. It was hot and hard work to reach this little woven basket on the rear top shelf but halfway into the storeroom, I discovered another made-in-Jaro rattan shopping basket. 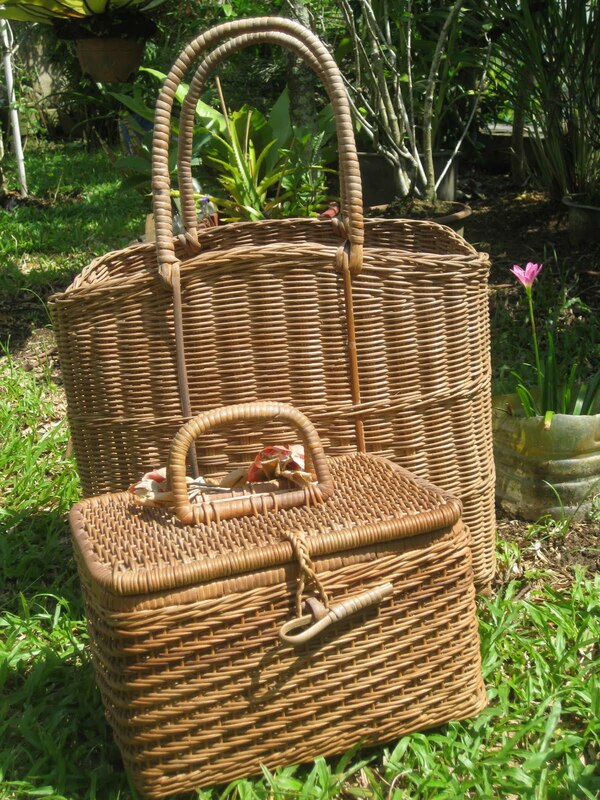 I recognized it instantly because it was used for many picnics and also to safely carry a hot-water flask and the usual paraphernalia for making baby feeds on outings. This basket has certainly served us well and even though the rattan has mellowed to a darker shade, its base and sides remain firm and strong. Soft toys were one of Jaro’s most popular products and they used to make a wide range of cute and cuddly stuffed toys. 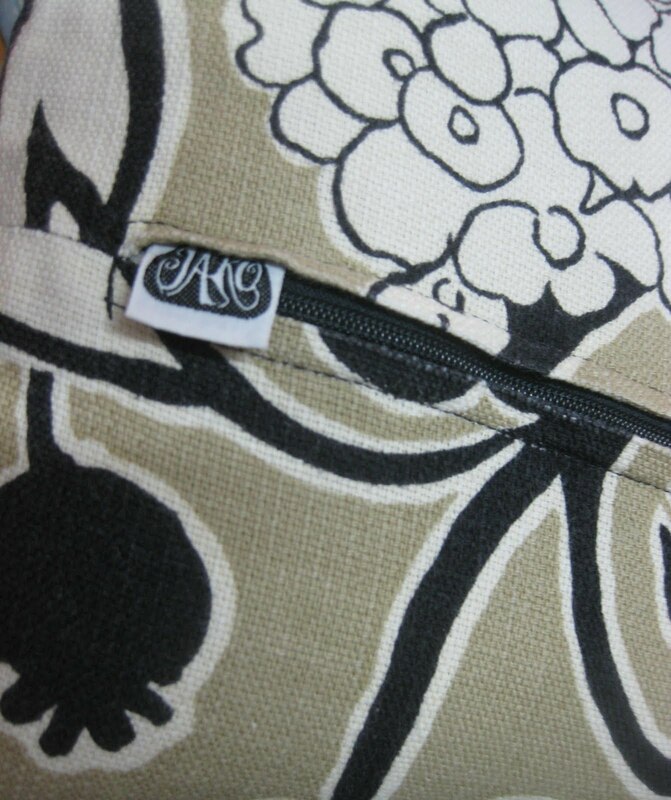 I remember buying a stuffed long snake made with fabric in a patch-work design to drape over the back seat of my car. Propped up to display its mouth, wide open with fierce fangs, this snake certainly attracted a lot of attention and never ceased to surprise friends and colleagues who took a ride in my car. As I searched through my collection of photos, I came across a picture of me holding a soft toy made by Jaro but I just cannot recall where that shot was taken nor have any idea of what happened to that doll. Even if it seems rather foolish now, I can only remember that time when I carried this doll everywhere because it was a gift from someone special. Just as I thought I had exhausted all avenues in my nostalgic quest, I spotted the woven rattan chest, neatly aligned at the foot of my bed. Buried under a pile of knick-knacks, I’m so familiar with it that I did not realize that this 4ft by 2ft Jaro-made piece is indeed a treasure chest filled with many precious mementoes. Even as my Jaro products remain beautiful and useful today, I’m excited about the new Jaro and its range of updated and eco-friendly products. In keeping with the Jaro tradition, their new range of products are also made with materials like rattan, paper and cotton for a new generation of customers who are looking for green living solutions. Jaro is now poised to become a popular destination for everyone who appreciates quality handmade products and I’m sure contemporary green consumers will be thrilled by products that are made with materials from recycled or sustainable sources. And yes, they still make fun items like sets of batu seremban but I already have a set of my own which I bought from Jaro a long time ago. I finally grasped what the phrase, sey yuit yah patt means. 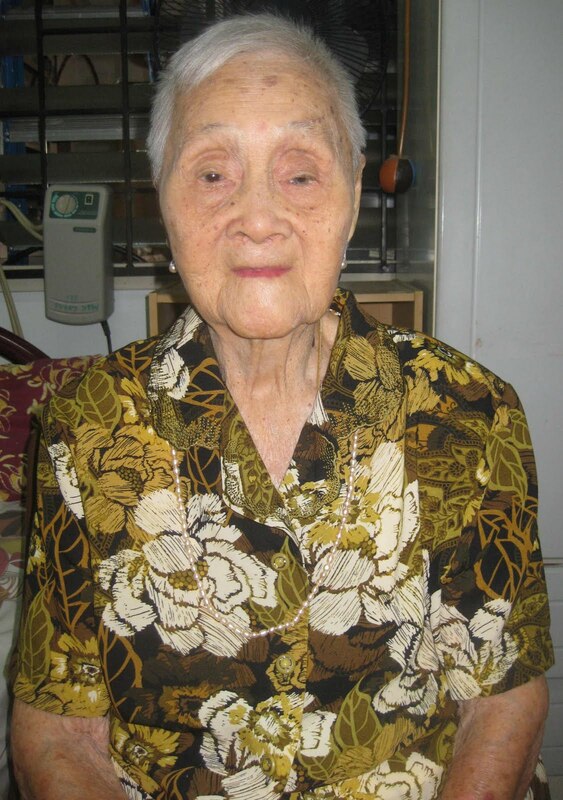 It’s Cantonese for 28th day of the fourth lunar month, the date of grandma’s birthday. 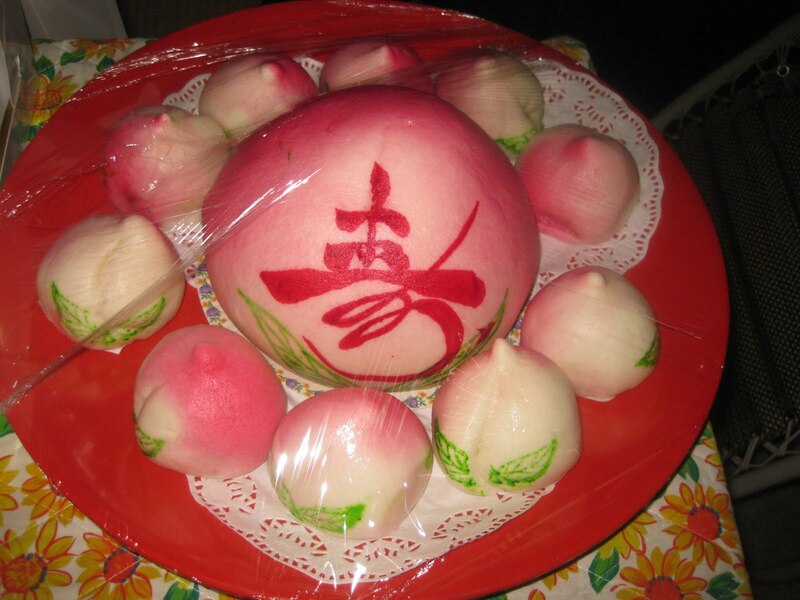 Every year, mum will look at the Chinese calendar to find which date it falls on in our calendar. Born in 1912, grandma turned 99 on her birthday which we celebrated on 28 May 2011. When the idea for a celebration was first mooted, some suggested that we wait to celebrate grandma’s 100th but the majority agreed that every day is a bonus with her and we should celebrate grandma at every opportunity. 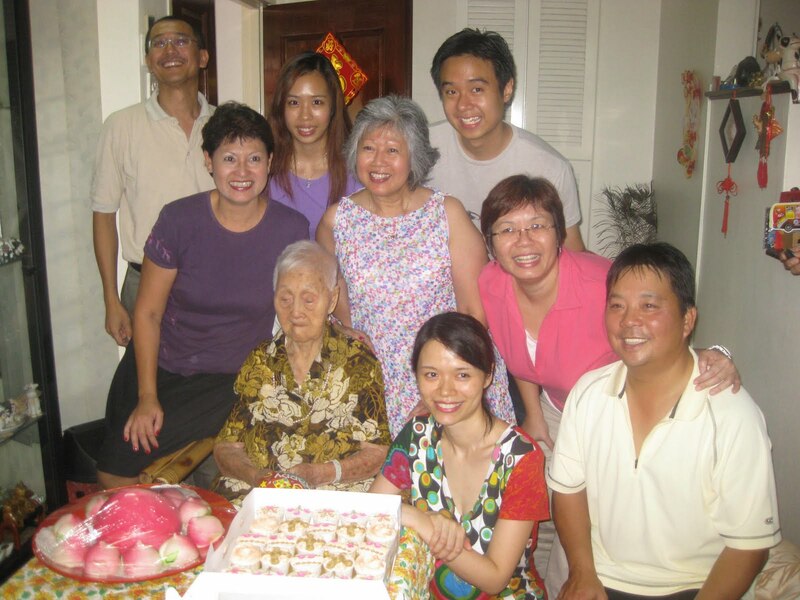 So after weeks of planning, family and friends came together for a special celebration with grandma in Aunty Polly and Uncle Steven’s home in USJ, KL. 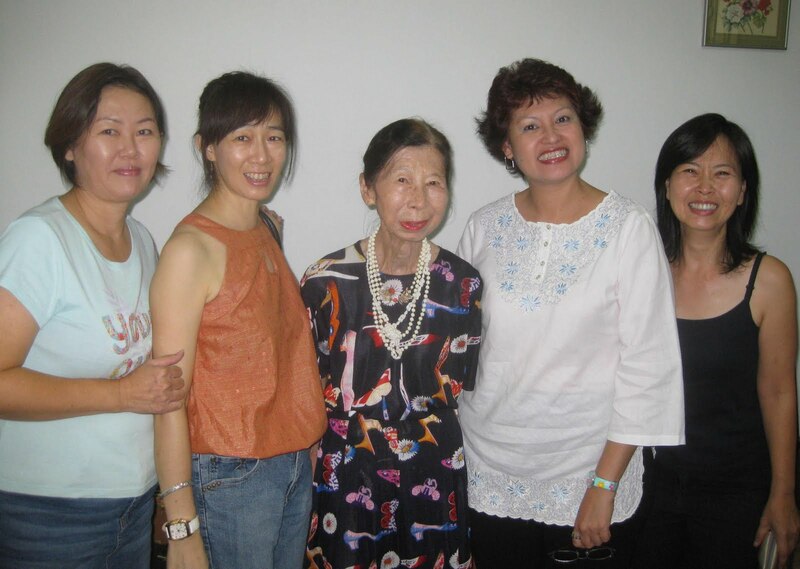 It was significant that grandma’s younger brother from Johor Baru and her younger sister, who lives in Singapore, were able to come. Likewise, it was important that mum and dad, in particular, were well enough to make the trip. We know that as our elder family members advance in age, there are fewer opportunities to meet others and we must take advantage of events such as this for the seniors to meet and reconnect with each other. With the convenience of low-cost flights, frequent-flyer points and timely business trips, we were happy to see Uncle Terry who came in from Jakarta, cousin Malcolm who arrived from Sydney in the wee hours that morning and cousin Dennis who arrived from Shanghai the night before, just for the party and returned by the midnight flight! My sister, Pearly, who secretly planned her trip from the UK, gave us a most pleasant surprise when we walked in and saw her! For a moment, I thought dad was going to have a heart attack because he was absolutely stunned. I don’t know when the realization actually sank in because he was still looking quite dazed when he sat down with Pearly by his side! There was not a hint from those who knew about her plans to come and mum, dad and I were taken totally by surprise. Amid shouts of “Surprise!” and camera flashes, Pearly and I fell into each others arms, while I was filled with shock and sheer joy! When I had sufficiently recovered from the emotional reunion, Aunty Polly asked me to dress grandma up. 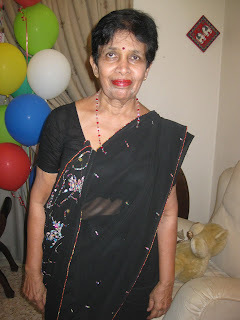 While all the commotion was going on, grandma was resting in her room and it was time to pretty her up for the party. With the help of the maid, I changed grandma’s clothes, powdered her face and helped to put on her pearl accessories. At 99, grandma’s mental health has deteriorated so much that there are days when she can hardly recognize any one. This happened to be one such day. Even as I kept up my one-sided chat with her, she gently smiled and cooperated as best as she could. I appreciate how Aunty Polly gave me the privilege to attend to grandma personally and it was a very special time for me. Before I presented grandma to the others, I gave her a warm hug and felt a sad rush of emotion because she could no longer reciprocate my hug. My cousins, who coordinated the organizing of this celebration remotely by email and telephone, did a great job and I’m impressed that the catering included traditional peach buns for special birthdays and longevity noodles! Aunty Polly had organized a lovely tray of cupcakes topped with pretty icing and it was typical of her thoughtfulness to give grandma the birthday girl, a little balloon with the words, “Happy Birthday” on it! Then there was a long, long, long photo-taking session. 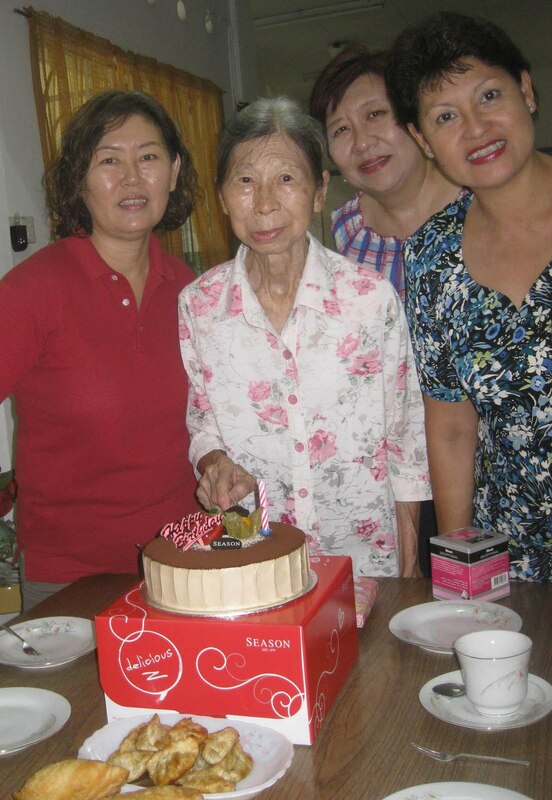 Everyone wanted to take a photo with grandma and I was glad that she quietly cooperated to the best of her ability. When she was tired, she became easily distracted so we had to attract her attention to keep her focused for the photos. As more people arrived, the photo session seemed almost endless. 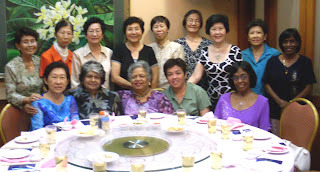 Finally, we called a halt because it was grandma’s meal time and we took a break to enjoy the sumptuous buffet spread. Grandma ate her soft meal with some vegetables from the buffet that was first blended for her. Grandma with my gift, her favourite face powder! For dessert, the peach buns were distributed and it was a pleasant surprise to find tiny little peach buns inside the largest bun. The cupcakes were also shared as dessert but everyone hesitated to take them because they were really too pretty to be eaten. 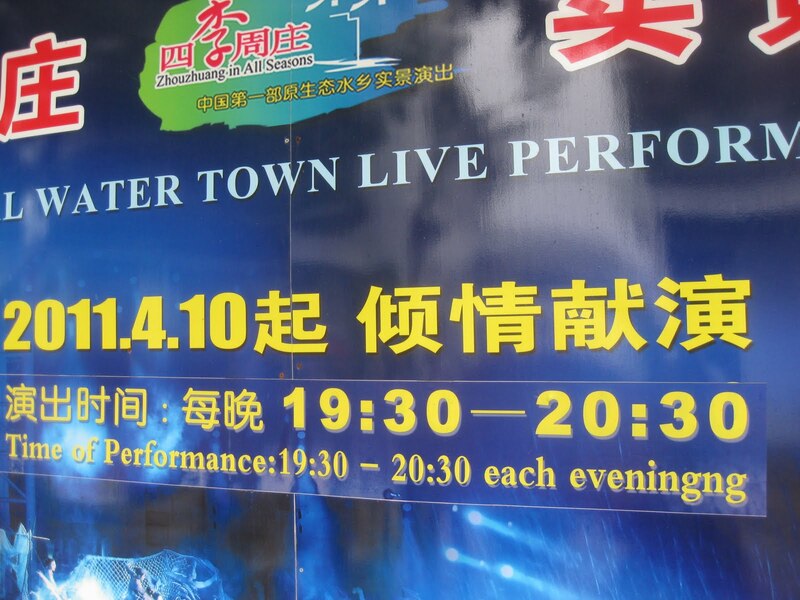 In spite of the sudden heavy downpour during lunch, we felt that the party really went very well. I was very amused by her reference to grandma as “99” because the “99” that we are familiar with is Agent 99, a sidekick of Maxwell Smart, the lead character of an old American sit-com, “Get Smart.” This bungling character, best remembered for using his shoe as a telephone, was clearly a less competent secret agent than Agent 99! So now when I think of grandma as “99”, she has an all-new image – nothing disrespectful, but one that’s both cool and endearing. 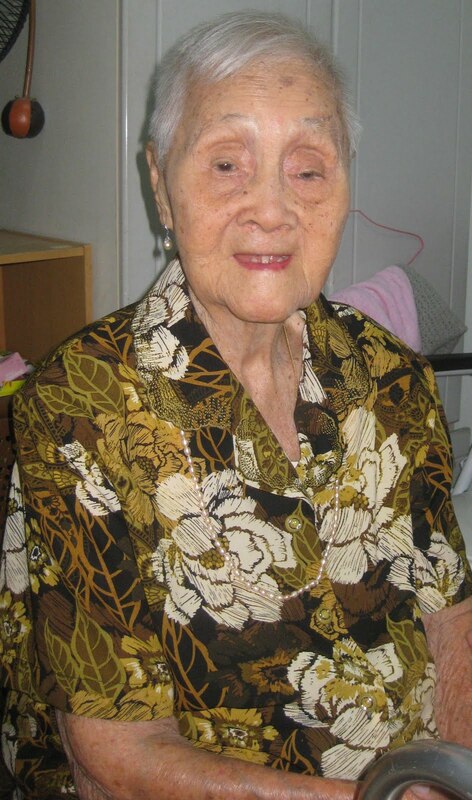 Happy 99th birthday grandma and many more to come! 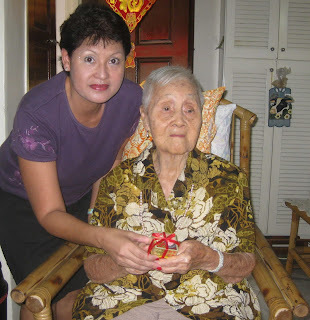 I was born at the foothills of Bukit Cina in Malacca, the sixth child in a family of ten children. Since young, I wanted to be a radio disc-jockey (DJ) and dreamt of becoming a nature park manager in my later years. I remember the thrill of being among the 10 short-listed people out of 400 candidates who were interviewed at Rediffusion but I was ultimately not selected for the job. I made my father happy when I agreed to go to teachers training college but the only thing I enjoyed there was playing hockey and being cheered on by the girls. 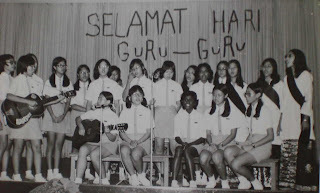 So in 1983, I started my career in Human Resource Management as a pioneer staff with General Electric (USA) based in Muar and later at their operations in Kota Tinggi. I worked with several Multi National Corporations and garnered wide experience in HR development including organizational development, setting systems, training, safety and sports organization. 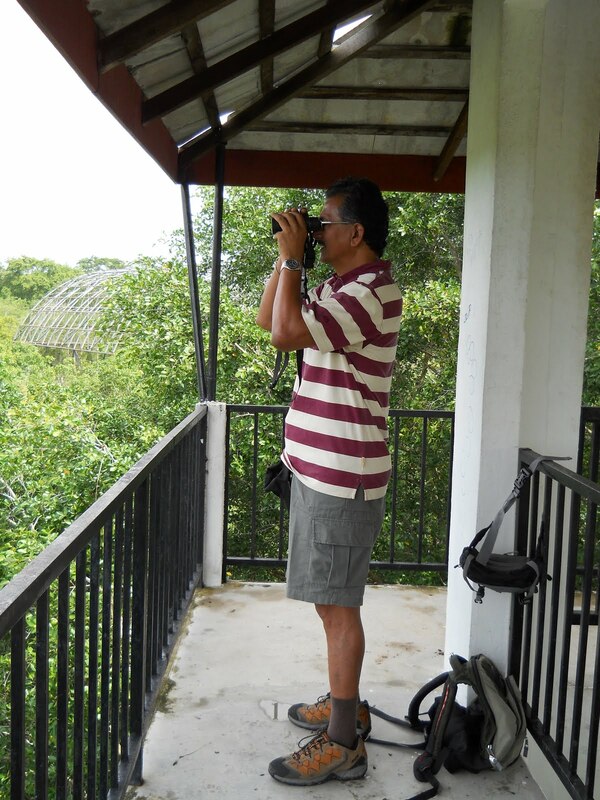 In 1986, I joined the Malaysia Nature Society (MNS) and discovered my passion for the environment as I started working as an Endau-Rompin nature park volunteer. I was a MNS Council Member since 2008 and traveled widely with the MNS and on my own to nature parks and heritage sites in Europe and USA. In Asia, I had many adventures in Japan, Taiwan and Nepal including trekking the Himalayas, Karakoram in Pakistan and climbing Mount Kinabalu twice. Some of the best landscapes I’ve ever seen were during the five times I scaled Gunung Tahan, our nation’s highest peak. My training and experience as a fire-fighter, diver, life saver and first-aider came in very handy when I was group leader for four of these climbs. My last climb in 2006 was particularly precious because my teenage daughter, Karen Kaur, completed the climb with me. In 2004, my dream was fulfilled when I joined Johor National Parks Corporation as Ramsar Park Manager to manage three of Johor’s Ramsar wetland parks. Malaysia has six Ramsar parks, with three or 50% of the nation’s Ramsar sites in Johor. My task was to manage the natural habitats and implement conservation while promoting tourism through training, education and research activities. I also implemented other relevant plans to ensure that the Ramsar obligations are met to preserve the biodiversity of the mangrove ecosystems and ensure that advancement is achieved in harmony with the community livelihoods, nature and the environment. After the 2004 tragic Asian tsunami, mangroves became better understood by the general public and were recognized as vital natural ecosystems because besides protecting the coastline from erosion and surge storms, their massive root systems are efficient at dissipating wave energy. When I was doing my Wetlands Management course with the Netherlands based UNESCO-IHE Institute for Water Education in 2007, I was shocked to discover that there was no module on mangroves. This was an opportunity for me to specialize in mangroves because they are predominantly found in South East Asia. Today mangroves are the “crown jewels” of Iskandar Malaysia because potential investors in Johor are keen to know how our environment is being preserved while development is rapidly progressing. They are interested in sustainability and often visit our Ramsar sites for an eco-tour to enjoy key attractions like village homestays and the fisherman’s livelihood. I had the privilege to be the official guide with distinguished guests like professors from local and foreign universities including Harvard University, USA, the Deputy Foreign Minister of Cuba and the Korean Ambassador to Singapore. I believe more can be done for ecotourism in Johor especially in packaging tours to a niche market of eco-tourists and researchers. The tours should involve the indigenous people, like the Jakun in the Endau-Rompin National Park, for cultural demos and promoting their interesting handicrafts like woven baskets and wood-based products. The tourism ministry can partner with MNS and World Wide Fund for Nature (WWF) to create a blueprint for tour packages that include nature guide, porters and even a cook. I moved to Pontian after living in Kota Tinggi for 10 years but I was very sad to see the forested land along the river, that once provided a variety of ecosystem services, had been developed into a new town. Known as the riparian zone, this area also supported important wildlife habitats. With seasons of heavy rain and high tides, the river burst its banks and thousands of people suffered when the town was affected by massive floods in 2006, 2007 and 2011 because now there is no riparian zone to absorb the excess water. 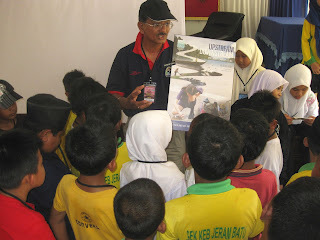 Recently I compiled a guidebook as a reference point for tour guides, teachers and students entitled, “A pictorial guide to Tanjung Piai Johor National Park,” to increase the awareness and appreciation of our world-class mangroves in Johor. This is a step towards educating the public in the four components of Natural Resource Management with Education through Communication, Education and Public Awareness (CEPA), Conservation, Research and Ecotourism. Harban Singh, 56, is a professional trainer who is passionate about the preservation of our wetlands. Born in Penang, Hassan Embi, the youngest of 12 siblings, lived several years in Canada to further his studies. On his return, he started a food business in Penang but decided to move to Johor Baru in 1995 to join his sister who had a successful bakery business in Taman Molek. At that time, his son Muhammad Zulfaquar, now 18, was 3 years old. Looking back, Hassan, 40, realized that he was living quite aimlessly probably due to his upbringing and family background. Their family home was not far from where the late P. Ramlee lived and his mother, Azizah, is believed to be the inspiration that moved P. Ramlee to write these lyrics: “Rupa kamu yang cantik, mata kamu yang bulat, membikin pemuda jadilah gembira…” in his song “Azizah.” This song was immortalized in P. Ramlee’s first movie, Penarik Beca, “The Trishaw Man” in 1955. In 2001 Hassan was introduced to the joys of riding Scrambler motorcycles and he discovered an avid interest in off-road adventure. This started him on a hobby in buying and restoring second-hand Scramblers and at one time, he had 8 Scramblers parked in his house compound. 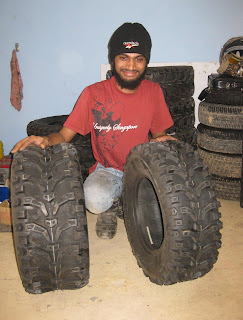 From baking cakes and cookies through hands-on learning, Hassan had quickly moved on to pick up skills in repairing and refurbishing Scramblers. Around this time he walked passed a motor exhaust shop in Taman Johor Jaya and saw what he described as quite an ugly contraption but it piqued his curiosity. As he paused to look closer, he learnt that it was a buggy offered for sale at RM15,000. 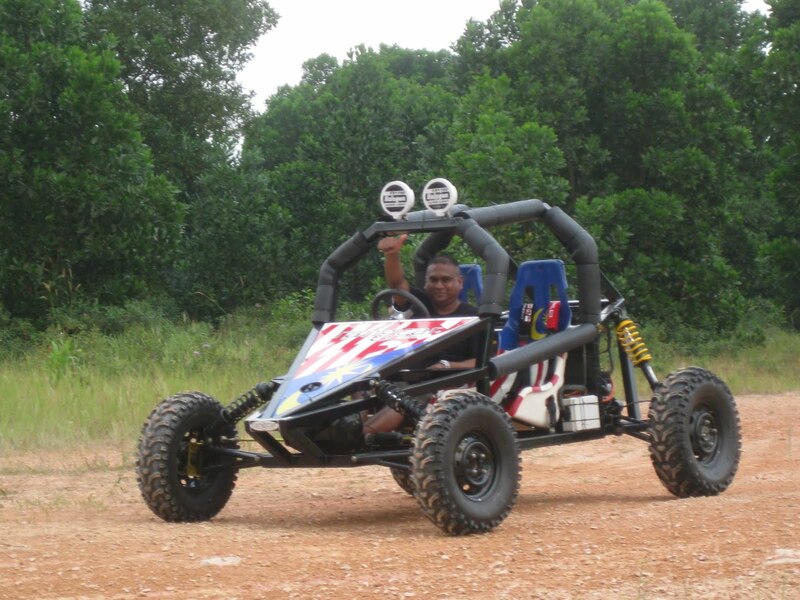 Already keen on off-road adventure, Hassan wanted to buy it for his son and after calculating what he could afford, he made a cash payment offer of RM8,500 for the buggy. The dealer not only turned down his offer but also threw him a challenge, saying: “Awak gila. Pergi bekin sendiri!” (You’re mad. Go make one yourself!) With off-road adventure already coursing through his veins, he was resolute about rising to the challenge even though he had zero knowledge about automobiles. So he approached his brother-in-law, a retired welding engineer with the Navy, who finally agreed to help him with his welding skills. Over the next 15 months, he worked with his brother-in-law in the latter’s workshop attached to the side of his house to build a buggy from his own design. 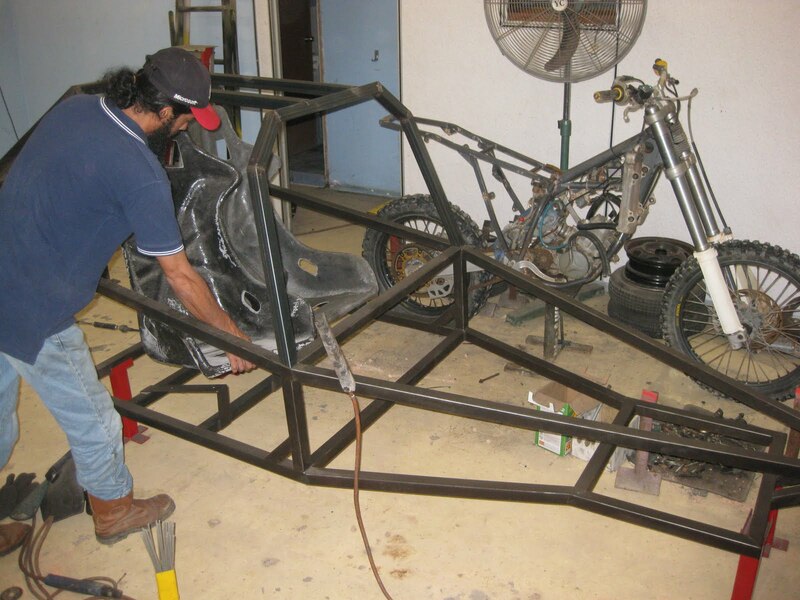 With relentless determination, they worked together for up to 6 hours per week to complete his first buggy. When he went on the first test-drive, Hassan was so full of pride that he described it as an incredible, out-of-this-world feeling! He took out an ad in Motor Trader, a weekly buying and selling guide for new, used vehicles and accessories and received many enquiries. Finally he sold it to a foreigner residing in Malacca at only RM8,500 – the exact offer price he gave to the dealer for that buggy he wanted to buy for his son and which started him on this challenge! This early success simply spurred them on to build and sell more buggies. With some experienced under their belt, now it took only about 3 months to complete one unit. Since selling that first buggy, they sold another 14 units in the next few years. One day Hassan discovered from the internet that buggy building is a viable industry because one unit of mini off-road buggy imported from Australia can cost between RM40,000 to RM50,000 per unit. He realised that if he cannot afford to buy one unit from abroad, other off-road enthusiasts would also have the same predicament. This realization helped him to arrive at a decision to start a buggy building business so that more locals could share the opportunity to enjoy the pleasures of off-road adventures. After more research, Hassan modified his buggy designs in a range of Rangcar buggy models that use imported tyres and Daihatsu engine and parts. To preserve and protect the framework for all-weather use, it undergoes a protective powder coating process. Now he and his team have shortened the production time to only 2 weeks for one buggy. “It’s so satisfying to see my dream turn into reality,” declared Hassan who believes that he’s the first, full-time registered buggy builder in the nation. 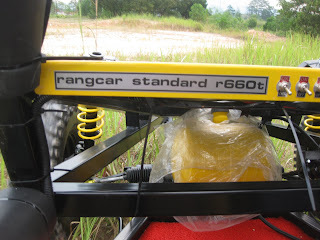 Since May this year, he has produced and sold several Rangcar Standard r660t buggies. Now his 100% custom-made prototype Rangcar Standard r660t comes in a choice of yellow, red, blue and green colours for its body and bucket seats. 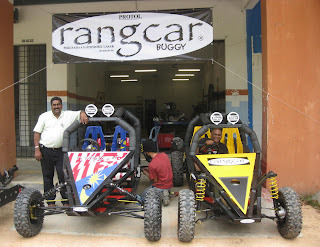 “I hope to see Malaysia have its own off-road buggy manufacturer and in 5 years time, we can have road-legal Rangcar buggies,” said Hassan as he discussed his ultimate hope to supply to uniform groups for training purposes and possibly exporting to Third World countries. 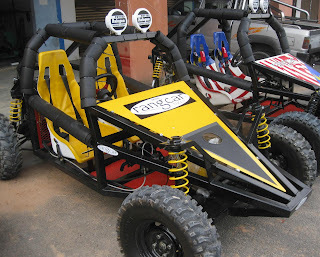 To view Rangcar buggies, visit Perusahaan Otomobil Lasak located at No. 359 Jalan Kenanga 29/9, Taman Indahpura, 81000 Kulai. For trade and retail enquiries, Tel: 012 – 4500 285.
as Hassan took me on an adrenalin-pumping test-drive! I was at a birthday party when some guests arrived and were ushered into the sitting room. Among them was an older lady dressed in an eye-catching black glittering sari who shook hands all around as she introduced herself as Rani. She mingled comfortably with the guests and in the course of conversation, the question popped up on which school I came from. Her tone of voice brought back a rush of bad memories, mostly of detestable Maths lessons under Mrs Param because she was our form teacher for not just one but two years. I was in shock as it dawned upon me that I was talking to none other than my former teacher, Rani Param. She used to look much taller and certainly more intimidating and I struggled to believe that it was really her because she was so small now – or did I grow so tall? As we went on chatting, I recognized her familiar mannerisms that confirmed that it is truly Mrs Param. She lives in Kuala Lumpur now and as she assured me that she’s still very much into Maths, teaching it in a private school, I suppressed an involuntary shudder. It’s interesting how teachers are often associated with the subjects they taught and I used to admire how some teachers could teach from their hearts without reference to any textbooks. I can look back now to Mrs Kwong’s Geography lessons and understand how my interest in travel was ignited when she made the topography and ethnic beauty of many lands come alive as she took me there, simply by talking and pointing to the places on the wall atlas. 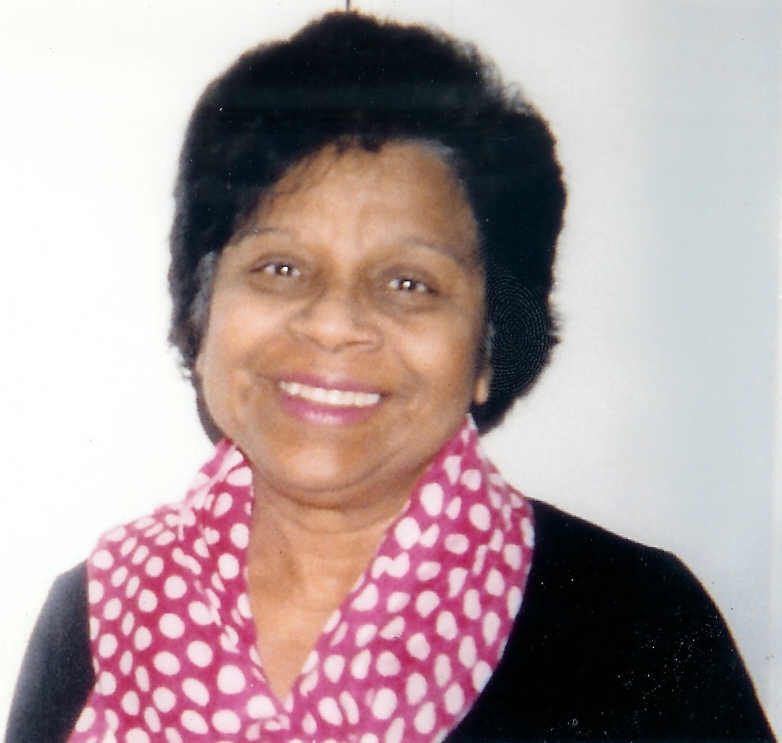 Her genuine passion for the subject was so infectious that I enjoyed her lessons tremendously and inevitably, scored highly in this subject both in O and A levels. If Maths used to give me nightmares, English Literature led me to wistful dreams, mostly about aloof and romantic heroes like Mr Darcy (Pride & Prejudice, Jane Austen). In those days, a great deal hinged on how our Literature teacher helped us to appreciate archaic language and made the stories relevant to restless teenage girls. At that time we depended on the written word and the way teachers stimulated our active imagination to enjoy lessons but now, such great literary works are often presented in plays and made into movies with popular actors to help audiences better appreciate Literature. One of the teachers, whom I associate with poetry recitation and good elocution, is Dorothy Pereira who was the winner of the National Level Bahasa Melayu Oratory competition in 1966. 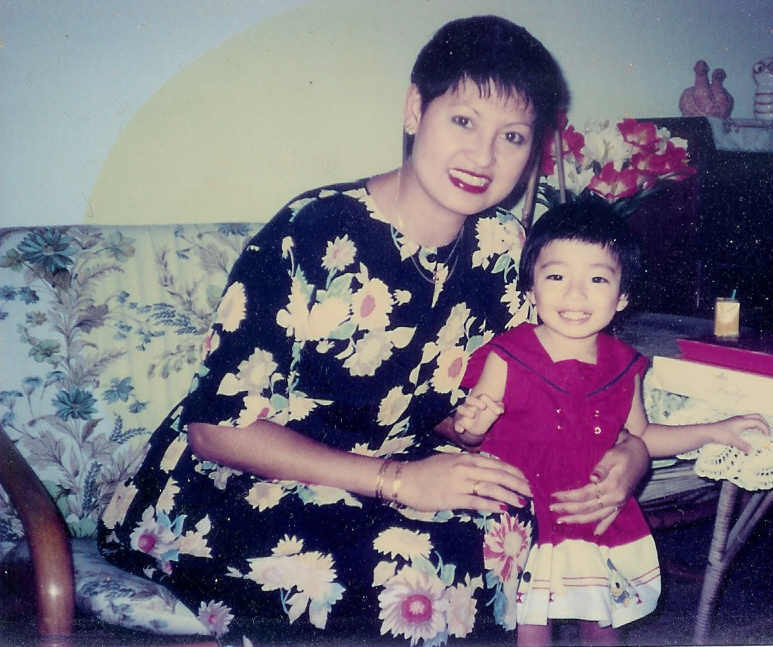 I admired her for what she represented and was further in awe of her when she became the first Malaysian to travel on the Trans-Siberian Railways, the longest railway in the world that connected Moscow with Japan. Years after we left the Convent, our paths recently crossed again, literally at the entrance of Plaza Kotaraya. 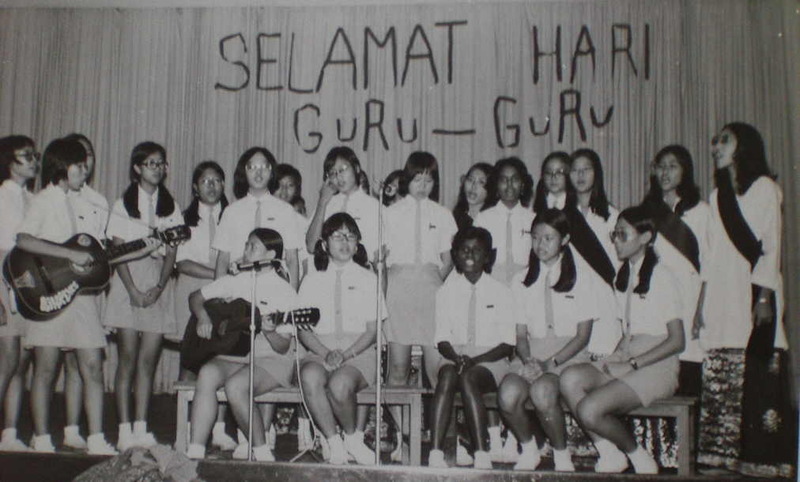 For many girls, teachers also impacted us with their fashion sense and at one time, it was the highlight of our day to see who wore the shortest mini-skirt or the trendiest platform shoes. 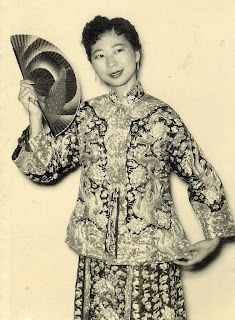 But the teacher who always dressed in colour-coordinated outfits complete with can-can skirts, matching stiletto shoes, handbag and accessories, was Amy Wong. 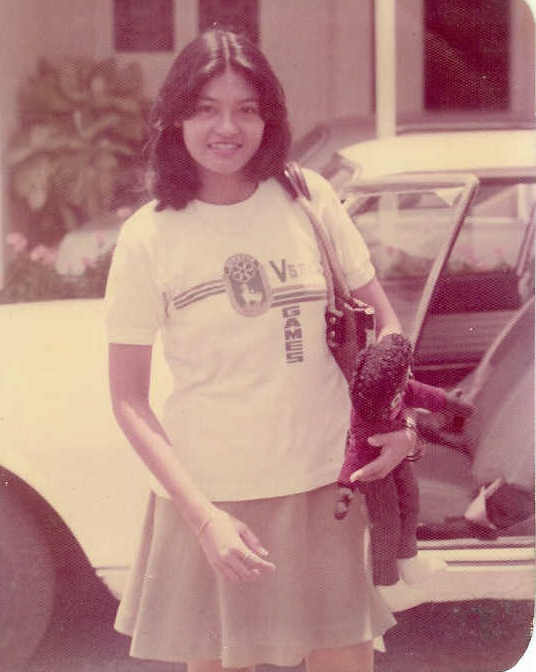 In addition to being among 148 Malayans in the pioneer batch of trainees at the Malayan Teachers’ Training College in Kirkby, England, she was the epitome of elegance. Since the late 1950’s, Ms Wong, who is distinguished by her slender frame and enviable 22-inch waistline, was a sought-after model for charity fashion shows. When my friends and I paid her a Chinese New Year visit recently, Ms Wong was such a good sport to show us her wardrobe and accessories, and proved that she could still fit into those pretty dresses. 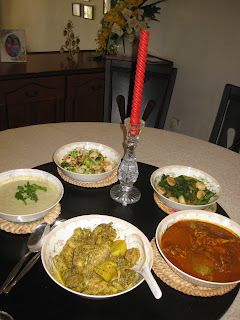 As she moved around with agility to serve us her special recipe, green-bean dessert, we marveled at how she remains alert and active in her retirement. Even as our former teachers are now our friends, we cannot deny the far-reaching effects of teachers on their students because they were our role models in so many ways. As we continue to hold our teachers in high esteem, we are grateful for how they encouraged us to pursue academic excellence while keeping a healthy balance of extra-curricular activities for a wholesome development. Thank you teachers and Happy Teacher’s Day! Happy 82nd Birthday Ms Wong! Then I received an email from Dorothy Pereira which reads: "Rani and I were friends at the Convent and we visit each other in KL till today. As for Amy, she is a sweetie. Amy taught me when she returned from Kirkby. I still remember the bright yellow shirt with black stripes she wore to class that day! Wow! She was a fashion plate! Keep up the fantastic down-to-earth articles that you write. Love, Aunty Dot."